Students generated questions on the phenomena individually and then as a group of four students. Each group came up with a minimum of ten questions. The students then changed their closed-ended questions to ones that were open-ended and picked the groups’ top three questions they had about the phenomena. Each class then developed a list of the top burning questions they wanted to explore. The questions were recorded on white paper and placed on a white board in the front of the room. The following is a sample question set generated by one of my classes (Figure 1). Figure 1 - Example of a list of questions developed by one of my classes. 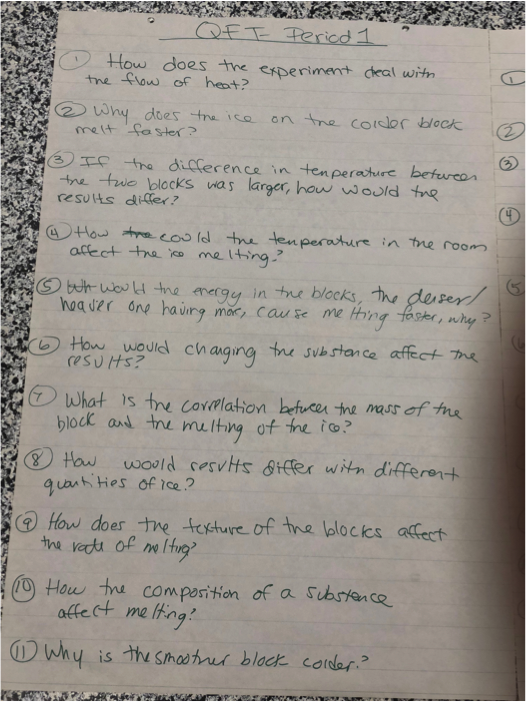 Following the question formulation technique protocol, students were asked to vote on the question they were most curious about from the class list. Most classes picked a question related to why the ice melted faster on one block. Next, students were instructed to use another science and engineering practice, developing and using models to the answer to the class question. Students were given about five minutes to create/draw an individual model and then compare and create a group model on white boards. This was followed by a gallery walk of the models where students took notes on how they should adjust their model or leave it if they felt their model was most adequate. Then, a spokesperson from each group explained their model to the class. After the last group presented their initial models, the class was asked to provide one piece of positive and negative feedback for each model. One of the benefits of this type of exercise is the shift in class culture as students openly share through positive feedback and constructive criticism how to improve each other’s models. One group chose to create an analogy of the metal block that melted the ice faster to that of a metal slide in a park (Figure 2). Figure 2 -One group chose to create an analogy of the metal block that melted the ice faster to that of a metal slide in a park. I was amazed at the creativity and explanation of how the slide feels hot on a summer night but freezing on a winter day. The most common type of model drawn (Figure 3) shows both blocks with particulate representations but is lacking clarity on the heat transfer or thermal conductivity, which is typical for an introduction to the thermochemistry unit. Figure 3 - The most common group model. Every single class had groups ask a question such as: “What would happen to the rate of ice melting if the blocks were at the same initial temperature.” The second day after the students’ models were created, I had students record several pieces of data: the temperature of the two blocks, the student desk top, and the metal legs of the desk using an infrared thermometer. This was to show the students the blocks were at the same temperature - room temperature. The students were amazed by this and were then given the chance to revise their models. The point of this is the students’ models can constantly be modified as new information is learned over the course of the unit. This is difficult for me as an educator since I feel I should never allow students to leave with incorrect information. However, as students learn new information, they are more interested in trying to find an answer to the chemistry behind the novel phenomenon in the lessons that follow. I adapted a handout from the Right Question Institute for this activity. It can be found in the supporting information below. This activity was a beautiful way to capture students’ prior knowledge about heat transfer. In the past, I have done pre-assessments such as anticipation guides to gauge students’ knowledge. But, never have so many misconceptions been revealed as they have with this QFT activity. Most of the time students mentioned that something “felt cold” due to something in the cold substance moving to the hotter substance, a misconception to heat movement from a hotter to colder temperature. My students learned about heating and cooling curves in middle school and know both solid and liquid phases are present at the melting point. However, to my surprise many of their models did not incorporate both phases at the particulate level during melting. When groups challenged each other, some students elicited an alternate conception that the solid phase is present for the first half of melting and then it transforms to liquid only for the second half so both are present, but not simultaneously This was how they justified graphs they had seen where both phases were present at the melting point! Many groups mentioned surface area/texture of the blocks as an explanation for why the ice melted faster and thought the material on one of the “warmer” block kept the ice cubes glued together and prevented melting. 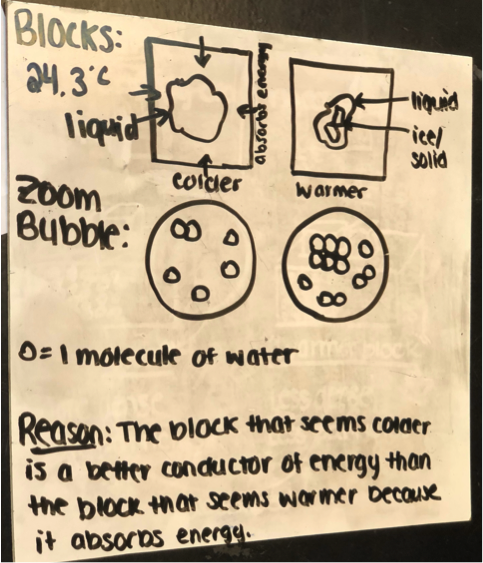 One group took it one step further explaining that the “warmer block” contained a hydrogen bonding blocker type substance that functions similar to the way inhibitors block enzymes. This explained why the ice didn’t melt as fast. Two groups in separate classes felt that heat flows from one object to another through tiny holes through an invisible mesh at the interface of each block, an interesting alternate conception I have never thought of. One group in each class mentioned conductivity as the answer to the phenomena, the correct concept, and some even mentioned the idea of freely moving electrons but had difficulty expressing the chemistry in a model. This is exactly what is desired, because the model will be adapted and modified over the course of the unit as more information is discovered. Lastly, I would encourage teachers to model with their students. I have a student who just entered my class this past month and drew his model as a block of ice with wavy lines next to the block to represent ice that had melted into water. This student is extremely bright, but his previous school did not use Modeling InstructionTM. 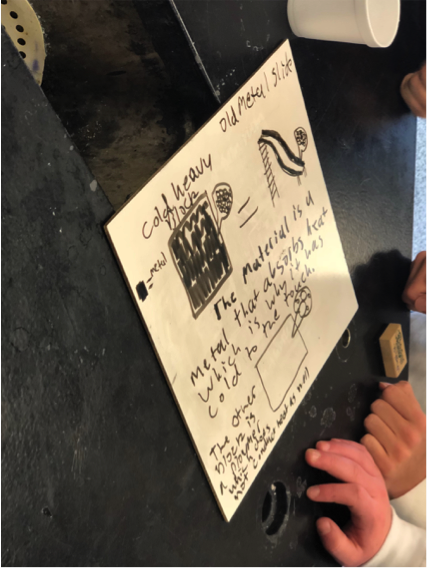 It was encouraging to hear the other students explain he was drawing the “macroscopic” level when he needed to draw on the “microscopic level” and this could be done with a zoom bubble! One takeaway from this student is despite the fact that he learned to draw a water molecule perfectly in one context at his previous school, he could not make the connection to the particulate level in this activity. This is a great example of how we, as teachers, need to constantly reinforce the idea that matter is made up of particles. Thus, if we do not reinforced this idea over and over, students may continue to think on a macroscopic level and visualize substances like water as wavy lines. They may miss the opportunity to see the particulate story of chemistry and the interconnections between topics within the course. Editor's Note: Read Stephanie's previous post introducing the ChemEd X community to QFT (question formulation technique). Obtain at least two ice melting metal blocks and an infrared thermometer. Quoted from the Amazon.com page for the ice melting blocks: "Place an ice cube on each of these two identical looking black blocks at room temperature. One ice cube instantly begins to melt and is totally gone in about 90 seconds. The other ice cube shows no evidence of melting whatsoever. Great for showing the difference in heat conductivity in different materials. Set of two blocks.? Refer to the student directions in the QFT Student document. Prepare ice to be used in the demonstration. The student handout is adapted from the Right Question Institute. Students who demonstrate understanding can develop a model to illustrate that the release or absorption of energy from a chemical reaction system depends upon the changes in total bond energy. Assessment does not include calculating the total bond energy changes during a chemical reaction from the bond energies of reactants and products. Emphasis is on the idea that a chemical reaction is a system that affects the energy change. Examples of models could include molecular-level drawings and diagrams of reactions, graphs showing the relative energies of reactants and products, and representations showing energy is conserved. Students who demonstrate understanding can create a computational model to calculate the change in the energy of one component in a system when the change in energy of the other component(s) and energy flows in and out of the system are known. Assessment is limited to basic algebraic expressions or computations; to systems of two or three components; and to thermal energy, kinetic energy, and/or the energies in gravitational, magnetic, or electric fields. Emphasis is on explaining the meaning of mathematical expressions used in the model. Analyze a Major Global Challenge is a performance expectation related to Engineering Design HS-ETS1. Students analyze a major global problem. In their analysis, students: Describe the challenge with a rationale for why it is a major global challenge; Describe, qualitatively and quantitatively, the extent and depth of the problem and its major consequences to society and/or the natural world on both global and local scales if it remains unsolved; and Document background research on the problem from two or more sources, including research journals. Defining the process or system boundaries, and the components of the process or system: In their analysis, students identify the physical system in which the problem is embedded, including the major elements and relationships in the system and boundaries so as to clarify what is and is not part of the problem: and In their analysis, students describe* societal needs and wants that are relative to the problem. Defining the criteria and constraints: Students specify qualitative and quantitative criteria and constraints for acceptable solutions to the problem.